Could John Cena team up with (or go up against) The Rock in a future Fast and Furious movie? It's not necessarily in the cards yet, but if it were up to Cena, it would absolutely happen. The wrestler-turned-actor has been landing more high-profile roles as of late and it's just a matter of time before he joins a massive franchise like Fast and Furious. But the real question is, would Dwayne Johnson even be up for it? Dwayne Johnson and John Cena both come from the world of professional wrestling and are two of the most successful examples of wrestlers who transitioned into acting. The two faced off against one another in 2012 and 2013 during a headlining match at Wrestlemania and that led to some genuine animosity between them. Cena got on Johnson's bad side for real by suggesting he had turned his back on the WWE. 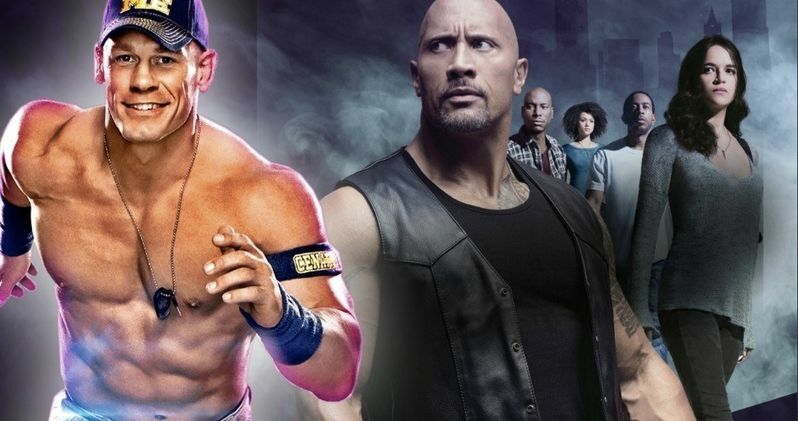 Cena has since admitted these comments were "stupid," but it still may hurt his chances of joining up with Hobbs in one of the new Fast and Furious movies, assuming The Rock has a long memory. In any event, Cena would love the opportunity. Here's what he had to say when asked about it in a recent interview. "That stuff is beyond my control, but I would absolutely love that opportunity. That, for me, would be a dream. I'm never really like, 'Oh, I'd like to work with this person,' but I just think between our chemistry in the live performance setting, there's something certainly there with The Rock. So that would be my one name on the wish list." There are plenty of opportunities for this to happen. Next year will see the release of Hobbs, the spin-off featuring Dwayne Johnson and Jason Statham. There's also going to be Fast and Furious 9 and Fast and Furious 10 coming down the pipeline over the next few years. And John Cena does seem like the kind of guy Universal would look to if they need to expand the cast, or even fill out some relatively ancillary, big bad guy role. But even if that doesn't come to pass, Cena is in good shape. Not only is he starring in the comedy Blockers, which has so far been getting very positive reviews, but he's also starring in the Transformers spin-off Bumblebee, which arrives in December. Cena seems rather excited about that. "It's going to be a wonderful piece of this franchise that I think people are going to enjoy. I was very intrigued being able to meet the team around the movie. [Director] Travis [Knight] is such a passionate man. The role they were talking to me about doing was very intriguing to me because it's a road I've never been down before, but a road I felt like I could accomplish. And then put that together with the context of the movie, the way that the consumer will now view Bumblebee, all of that stuff was very interesting to me. And then they were stupid enough to say yes." Since its relatively humble beginning, The Fast and the Furious movies have become some of the biggest cinematic events on the planet. The last two installments made a combined $2.7 billion at the box office and, in total, the movies have brought in a staggering $5.1 billion. If John Cena continues to improve his acting skills and prove he can be a box office draw, it's not hard to imagine Universal may give him a call for one of the upcoming Fast and Furious movies. This news comes to us courtesy of Entertainment Weekly.